A very special and healthy valentine treat is Nutella date balls with nut in the center. 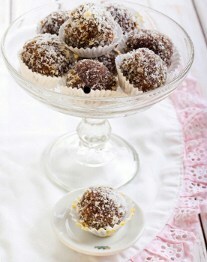 No cooking and baking is required and delicious balls are ready to serve at valentine or any special occasion. Kids would definitely love for its chocolate coating. In a bowl, mix the ingredients for coating, until they are incorporated and mixed well. Coating should not be too hard and thick, if it is, add more chocolate syrup to make it less viscous. Add grated chocolate as much as you want in the mashed date mixture and mix well. Take a portion of mashed date, place a cashew nut in the center and press the date around the nut making a ball. Now roll this ball in the chocolate coating mixture. Like wise make all the balls. Garnish with coconut and refrigerate for 5 minutes. Place them in a serving plate, top them with a cashew nut and/or smarties, as you like and serve.